Do you ever wonder why a Gothic glass is decorated with prunts? 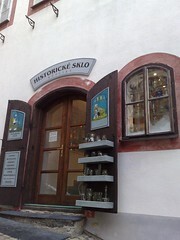 Find out the answer at this glass museum/shop, where you can learn the history of glass making in the Czech Republic. 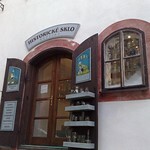 A friendly will guide you to replicas of historical glassware while giving you a short lecture on glass making history in Czech, English or German. When you visit this museum, look for a Baroque mural painting of a bear (a symbol of Rosenberg family), which underwent restoration in 1994.